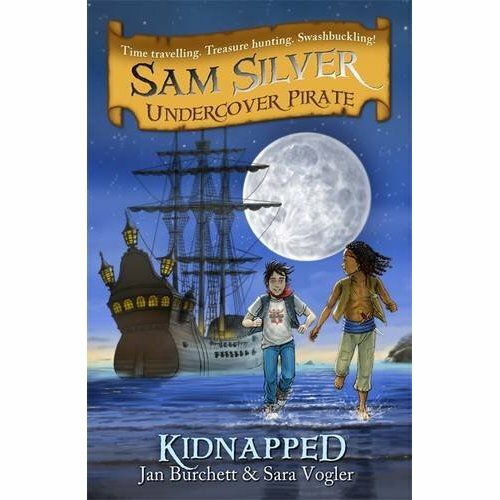 Book 13 in my challenge to read one book (I haven’t read before) a fortnight in 2012 is Kidnapped in the Sam Silver Undercover Pirate series by Jan Burchett and Sara Vogler. So I appear to be reading lots of children’s books at the moment, but sometimes you just need an easy read and a fun story, and Kidnapped provided me with both. The story is the third in a series about a boy called Sam Silver, who found a gold coin which, when rubbed a bit like a magic lamp, transports him back in time to the pirate ship Sea Wolf. In this book Sam decides to travel back and have an adventure before one of his boring relatives comes to visit. He returns to the pirate ship, where a battle ensues with what at first look like naval ships. They’re not. Instead, they contain other pirates who are after Sam’s friend Charlie, who is on the Sea Wolf because her horrid stepfather wants her to sign over her fortune to him. What follows is a true child’s adventure story, where Sam and another friend and crewmate, Fernando, mount a mission to rescue Charlie. There’s lots of sneaking around, some cunning employed by both the good side and the bad, and a big fight at the end to top things off. Kidnapped, in its 126 pages, manages to take you right into another world and then bring you back out again, just like Sam goes into another world. The language is straightforward, meaning the focus is really on the story, and it’s a great story, with just the right amount of excitement and tension, with fun characters and the required happy ending. I loved this book, and will be passing it on to my young cousin, as it’s definitely the type of story that will get youngsters reading. This book has pirates, and time travel. How can it be anything other than good?